The flora and fauna is also very rich: there are 615 species of vascular plants and 318 species of vertebrates, 245 of which are birds some of the migrating from Europe to Africa. If you like outdoor activities, the area is well-known to practice surfing, kayaking, canoeing, trekking ... The house is located in Ibarrangelu. 2km away from Laga Beach, 4 from Laida Beach, 10km from Gernika or Lekeitio and 45 km from Bilbao. 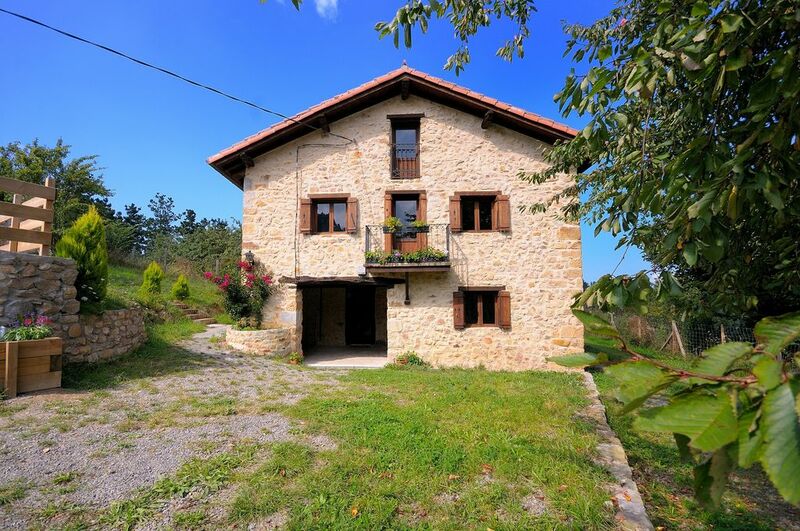 The house is a typical old basque farm dated from XVII century and recently renewed maintaining its style. The property includes 3 hectares of terrain. Since the house is removed from the village, we recommend to have a car at one's disposal. We had a great time staying at this lovely house! Beautiful wildlife (we saw quite few wild boar, including the babies), gorgeous hills. It's a great house for families! Our children stayed in the 'big room,' which had a swing and a ladder hanging from the rafters. They had a wonderful time playing games of pretend in there. Go for a hike up the nearby trail - it takes you to Akorta. Another great thing about this location is that it is close to both Laga and Laida, two stunning beaches. Diego is a responsive and helpful host! Maison ancienne, très bien rénovée en gardant le charme d’origine. Calme et verdure. A 5 minutes de la plage de Laga, spot de surf et très jolie plage, la maison est en pleine nature, très calme et facile à vivre. Sehr ruhig gelegen. Entspannung pur. Es war alle vorhanden, nicht nur abgezählt. Alles in allem gut. We stayed for 9 nights in this beautiful house in the Basque country, located in the biosphere Urdaibai. It's located in a serene location, closeby to the beach. There are some lovely coast villages nearby which is cool to drive through if you have your own car. Lots of things to do closeby to the house (<1h drive), things like swimming, hiking, sightseeing, bigger cities like Bilbao. The house is quite spacy. Due to the way its build its a little bit dark inside, this means it stays cool even during really hot days. There is plenty of room to sleep (4 bedrooms). Cooking equipment is also good. Big plus is the space around the house. Lots of places to sit and enjoy the sun, but also enough places where there is sufficient shade during hot days. Diego was very welcoming on the day we arrived. Helpful with showing us around in the house and tips to see/ do in the area. Would certainly recommend this house to others. Big thumbs up!